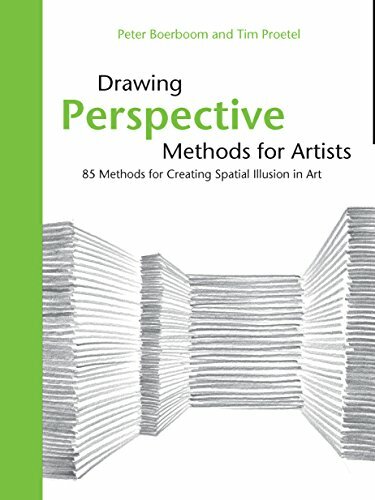 Drawing Perspective Methods for Artists is a collection of tips and techniques you can use to create the illusion of perspective. The book mentions 85 methods, but they are actually divided into 8 perspective fundamentals, so each fundamental has various examples and situations. Each example has only a short caption. When you look at the visual example, it's pretty clear what they are talking about. The concepts are easy to understand. Since there's not a lot of text in this book, it's a pretty quick read even at 160 pages. You can probably flip through the book under half an hour. There are no step-by-step tutorials in this book to follow, so to really make use of the concepts, you have to put them into practice in your own sketches. This book does not cover the usual one, two and three point perspectives. Because of that, it can be a complement to perspective books that do cover them. Overall, the book does a good job at presenting the quick tips and drawing techniques.